There's a reason everybody wants to go to Cuba now. Here's how to do it right. We're cruising Havana’s Malecón seafront boulevard in a cherry-and-cream 1958 Edsel convertible – one of seven open-top Detroit dowagers hired for a final-night fling on the National Geographic Expeditions tour that I’m leading. Travelers whoop as their chauffeurs tap out an air-horn calliope of favorite tunes. Every fourth car we pass is a creaky 1950s classic rumbling down the road to the rhythm of rumba on the radio. It’s a form of twilight-zone travel made more surreal by roadside billboards featuring socialist slogans and a bearded Che Guevara and Fidel. As the sun sinks below the Atlantic horizon, a carnal-red sky illuminates art deco and modernist skyscrapers that recall Havana’s prerevolutionary mobster era. Hollywood couldn’t have dreamed up a more iconic stage set. Cuba’s frozen-in-time, franchise-free cityscapes are finally on the cusp of a U.S. invasion. The forbidden fruit is suddenly not so taboo. President Obama’s December 17, 2014, announcement that the U.S. and Cuba intend to resume diplomatic relations presaged an easing of travel restrictions. Every U.S. citizen with a passport seems seduced: The thaw fueled a 36 percent rise in visits by Americans to the island in the first quarter of 2015. The July 2015 reopening of the U.S. Embassy in Cuba is sure to sustain the trend. “New rules allow U.S. citizens to travel to Cuba without asking Uncle Sam for permission in advance – as long as their trip fits one of 12 permitted categories, such as journalism or religious travel,” says Orlando-based Virtuoso travel advisor David Lee, who has traveled numerous times to Cuba. But ordinary tourism is still banned. It will take an act of Congress to lift the travel restrictions. 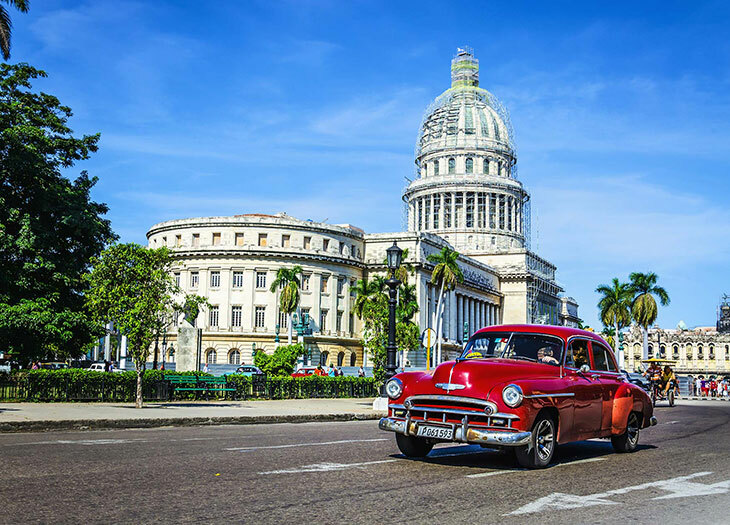 Until then, the simplest legal way to travel to Cuba is to sign up for a “People-to-People” (P2P) educational program such as those offered by tour companies licensed by the Treasury Department’s Office of Foreign Assets Control (OFAC). “We’re also able to customize more-flexible private itineraries tailored to the specific needs of clients within the 12 licensed categories, so long as it complies with OFAC requirements for legal travel,” adds Lee. That includes maintaining documentary proof that a traveler has kept to a permitted agenda. As for accommodations, Cuba’s hotels run the budgetary gamut, but the state’s star system is overly generous, and U.S. tour groups pay a premium. Foreign-managed hotels are always superior to those operated by Cuba’s own chains. The upshot: It pays to rely on a travel advisor who knows how to expertly navigate the legal and logistical minefield, helping travelers avoid potential violations. For example, travelers to Cuba can fly direct from the U.S. using charter flights that must be booked through a licensed “travel service provider.” However, in order to meet OFAC requirements, their entire itinerary must comply with those sanctioned categories, notes Lee. “Leave the beach towel at home. You can’t simply sign up and head off to Cuba’s stunning white sands,” adds Cuban-born Edie Mosquera, a Fort Lauderdale-based Virtuoso travel advisor. Travelers visiting Cuba should focus on experiencing its rich, vibrant culture. “Cubans are outgoing, fun-loving people. They feel a great admiration for America and are strongly influenced by American culture,” she says. People-to-People trips are required to maintain a full schedule of activities designed to, in OFAC’s parlance, “result in meaningful interaction” with Cubans. Expect little free time. Depending on the P2P program, you’ll meet with artists, city planners, journalists, and/or historians, plus experience, usually, a medley of musical encounters that steep you in Cuba’s cultural potpourri. Tours by National Geographic Expeditions (one of the first companies to offer Cuba P2P tours back in 2011) feature a performance by a children’s theater group, as well as the Cantores de Cienfuegos choir – uplifting experiences that have been known to inspire tears among guests. Abercrombie & Kent even includes a cooking class at a paladar – one of Cuba’s new private restaurants that are setting the country’s culinary scene abuzz. And the nightlife? Hot enough to cook a spicy ropa vieja (stewed lamb). But come prepared: On a recent trip, one traveler arrived with barely $100 in greenbacks – about enough for a night at Havana’s legendary Tropicana cabaret. Error! Sure, President Obama’s new regulations pave the way to someday use U.S. credit cards in Cuba. Alas, for now, cash is still king. The good news? U.S. visitors can now bring back $400 in Cuban products, including $100 worth of cigars and/or rum. The U.S. government, however, sets no limit on the amount of artwork you can buy – your Picasso-like canvas by renowned artist José Fuster is considered “informational material.” So be prepared to splurge: Cuba’s vivacious art scene elicits oohs and aahs. Not that visitors will be singing its praises over Skype. Digitally speaking, Cuba isn’t exactly what you’d call surfable. Although most hotels have Internet connections, only a few have Wi-Fi, which barely exists outside the hotels – downloads can be so slow that you’ll dream of your old dial-up network back home. Don’t expect the obligatory scratch card that grants access to the government-run system to be available when you need one. And don’t expect your cell phone to work for calling: No U.S. phone company yet offers international roaming in Cuba (although the new regulations gave permission). “Cuban reality virtually requires travelers to be unplugged,” notes Mosquera. That includes logging out of the twenty-first century, I muse, as my group revels in its date with Eisenhower-era American iron. Cruising the timeworn Malecón, they seem utterly charmed by this beguiling, long-forbidden destination only a 45-minute flight away from glittering high-rise Miami. Browse all of Virtuoso's tour options. Wireless Traveler’s options for staying connected in Cuba include a SIM card that inserts into an unlocked cell phone and rental phones that work from within the country. Travelers on Backroads’ eight-day walking tour hike in the Sierra del Rosario Biosphere Reserve and Santa Catalina cave system. Along with gaining insights into Cuba’s organic farming at an organopónico (cooperative urban garden), participants explore vibrant Old Havana and take salsa dance lessons. A Cuba expert accompanies National Geographic Expeditions' nine-day program for Afro-Cuban music and dance programs in Havana. Also on the itinerary: the colonial city of Trinidad, a choir performance and visit to an art school in the port city of Cienfuegos, and a visit to the Bay of Pigs. Abercrombie & Kent's 13-day trip ranges from the revolutionary heartland of Santiago de Cuba to Havana and beyond. 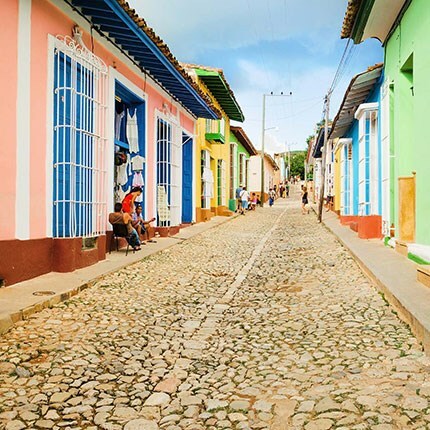 Highlights include Fidel Castro’s birthplace at Birán and ages-old Remedios, and elders who teach travelers traditional danzón music and dance in Santa Clara. Explore Cuba’s wild side on Zegrahm Expeditions' 11-day trip, with overnights in Topes de Collantes National Park, birding in the Zapata wetlands, and boating through limestone caves in the Viñales Valley. Cultural elements include a Buena Vista Social Club show and a visit to Hemingway’s home in San Francisco de Paula. With Havana as a base for Absolute Travel's eight-day immersion, travelers take in performances, art galleries, and studios, and meet Cubans ranging from music professors to a flamenco-troupe leader. Another highlight: meeting with students at Proyecto Grabadown, a program for disabled youths. The Slavskys connected with a travel advisor one week into retirement. It changed everything. Some travelers fear an advisor won't listen to their needs. Doug Coe found out that's not the case. Emily Howard Slater honeymooned in Santorini. Her advisor knew exactly what she'd like. Read real stories about real travelers connecting with their Virtuoso advisors.